"This medieval wall painting shows cosmonauts in their vehicles." Though von Daniken's sensational Chariots of the Gods ignited interest in the ancient astronauts theory, a lot of evidence exists which backs-up the claim to some extent. 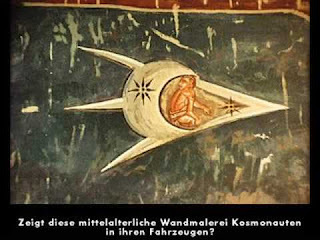 The cave paintings of Tassili n'Ajjer are particularly intriguing, as is the cave painting of ancient cosmonauts above.